Since the start of August I've been working on plans for my two thousand five hundredth different roller coaster, a ton-up that I fully expect to be my last major achievement for at least a couple of years. Today in pursuit of this target I decided to do something exceptionally stupid – I drove from San Antonio to Dallas (and back again) in order to tick off two bonus credits. This gave me a little more than eight hours in the car in pursuit of something that at the end of the day matters to absolutely nobody. This is a stupid hobby. Over the last few years a large number of family entertainment centers around the world have installed Compact Spinning Coasters from SBF Rides. RCDB lists an incredible fifteen deployments of the "two loop" model during 2017, including one that premiered at Alley Cats in November, giving it the curious if completely pointless distinction of being the last new coaster in the United States that year. The Rattler (#2494) features bright green track and shiny snake-themed cars, but the only thing non-standard about the ride is its appearance. I was given ten laps with a lot of spinning, leaving me vaguely dizzy on disembarking. One interesting point about the park is its pricing. Signage at the ticket desk indicates that outdoor rides cost $3.99 plus tax, which I figured should be around five dollars. The actual cost for one ride was $7.57, marking a new low (or should that be high?) for hidden fees. Part of that figure was for a reloadable smart card, but despite this the point holds; why on earth is it so hard for organisations in America to charge the prices that are actually displayed? It must be tedious to maintain large quantities of coins for change, and that's before you think about the efficiency hit; I was at the ticket desk for at least half a minute while I dug through my wallet in search of the requested amount. 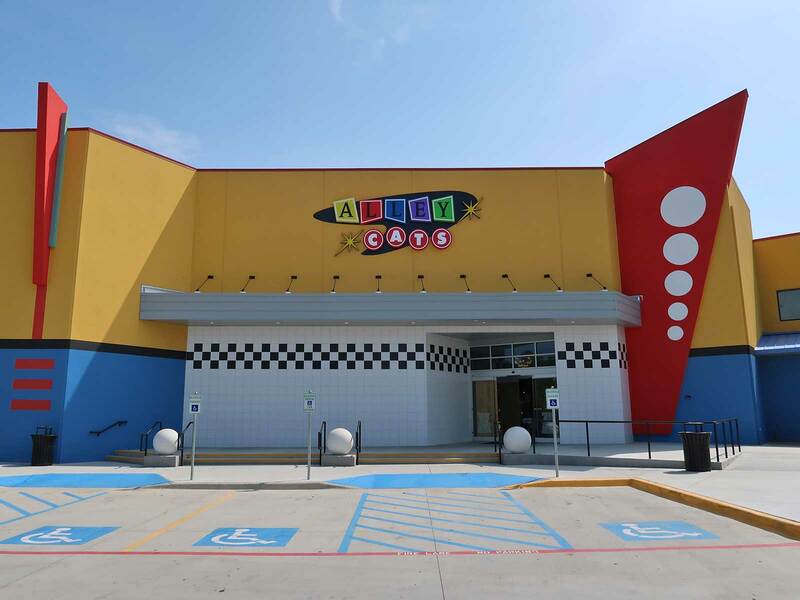 The regular parking lot at Six Flags Over Texas was virtually full when I arrived just before noon, a timely reminder that nobody in their right mind visits a large corporate theme park on a Saturday in mid-August. The last available spaces were next to the turnaround for Titan, just shy of a kilometre away from the main entrance, and while shuttle trams were operating I decided to walk instead. It's difficult to estimate just how much money the park makes from parking given that the cost is included for season pass holders, though one can say that a full lot at the sticker price of $25 would bring in a figure to the north of two million dollars. Despite the crowds however there was virtually no queue for Joker (#2495). Part of that likely stems from its location in a cul-de-sac in the north eastern corner of the park, though I rather suspect that a more significant factor is the fact that the ride isn't something that the average punter will want to do more than once or twice in a park with many far better roller coasters. The experience on this model was a little more sedate than the version I'd ridden less than twenty-four hours before, and though the flipping motion was still a bit too aggressive for my taste I did at least manage to disembark without feeling queasy. 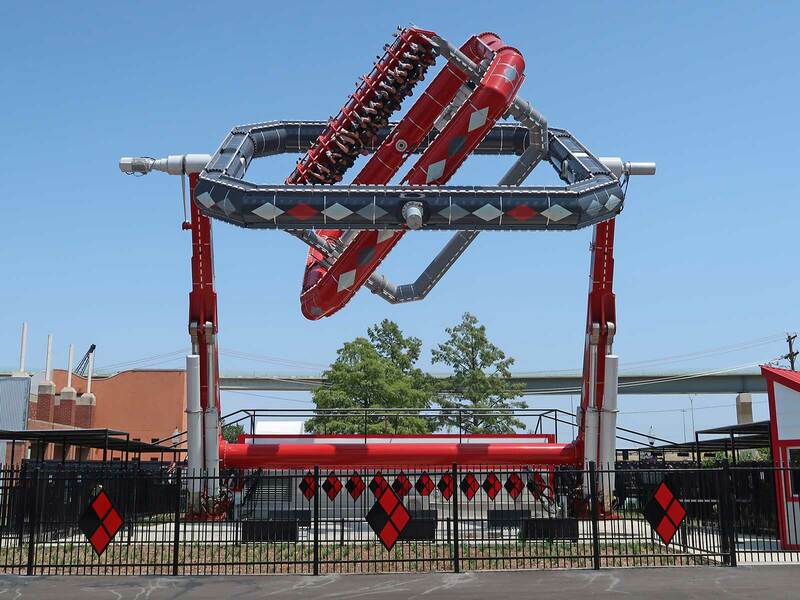 The coaster stands directly adjacent to Harley Quinn Spinsanity, one of two versions of the ABC Rides Tourbillon supplied to Six Flags this year. These are to the best of my knowledge the first installations of the type following the debut of the prototype at the Hong Kong Carnival in 2015. The design can be thought of as a Top Spin with two extra axes of rotation, guaranteeing even British readers a freedom of movement not seen in earlier flat ride designs. I'd have liked to have given it a try myself but decided not to tempt fate with a four hour drive ahead of me. Though there was nothing else on my must do list today I decided to sacrifice some sleep for quick laps on the two main coasters. New Texas Giant had a three quarter hour wait thanks to single train operation, though I've since learned that this was due to a technical problem that was being actively worked on; the second train was returned to service shortly before I reached the front of the queue. The back row was off limits to me as a single rider, but I took my seat in the front of the back car and immediately noticed a fantastic new addition: zipper pouches on the back of each seat for safely storing mobile phones and keys. In recent years large corporate parks have taken to putting metal detectors at ride entrances with zero regard for guest satisfaction; I'd never have dreamed that a Six Flags park would be the one to implement a better solution.